While in Houston the guys visited the Tirr Memorial Hermann Rehab Hospital for this week’s presentation. Paul was excited to be given a ride to the rehab hospital in a Pick-up truck. The view was much better than in his minivan. He thought it was fitting to be in Texas and get taxied in a truck. The facility had made arrangements for two presentations that day. The first for the patients and a second one for the therapists. This arrangement worked really well because it allowed the athletes to focus each presentation accordingly. For the patients the focus was to encourage them to get out and be active, that being in a wheelchair should not keep someone from experiencing fun activities and even competing as an athlete. 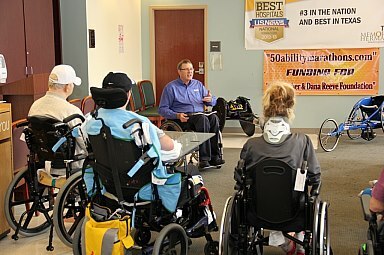 Also, for both the patients and the therapists, showing them the racing wheelchairs as a small example of some of the adaptive equipment available today can be an encouraging goal to reach while working through physical therapy. Leaving Tirr Memorial the Team Reeve Athletes, themselves felt encouraged by their accomplishments for the Christopher & Dana Reeve Foundation and for the patients and faculty they met. You see, Tirr Memorial is one of the many rehabilitation hospitals that are affiliated with the Christopher & Dana Reeve Foundation so our cause was well known and deeply supported. The Houston Marathon is well known for being one of the fastest marathon courses. It was a very flat and fast course unlike last week’s hilly and slow Mississippi Blues Marathon, plus mid 70’s was expected for race day. This was good news for Paul, Grant and Aaron until they watched the local weather report. The updated forecast said that a cold front was coming in which would change Saturday’s 74 degrees and clear skies into a rainy 41 degrees for Sunday’s race. The morning of the race there was a gentle rain as they pushed their way to the starting line to get ready. If it will stay like this it will still make for a great race. 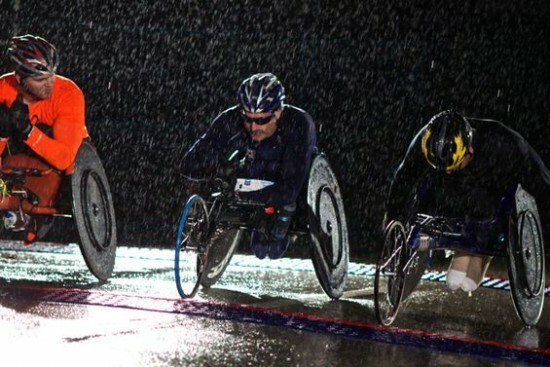 But as the time got closer to the start of the race, the rain came down harder. 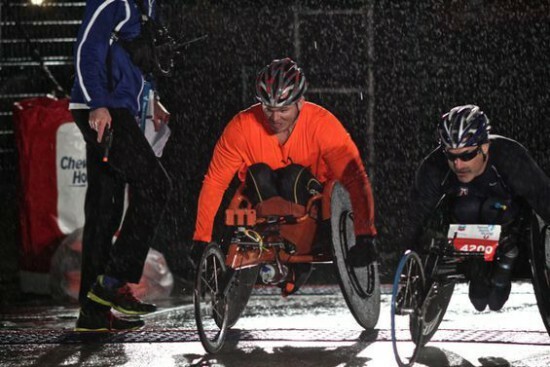 Some say that rain is a sign of good luck and for Grant it proved to be true since he was the first to cross the finish line. However, for Paul and Aaron the rain had a completely different effect. Paul got two flat tires and Aaron was pulled off the course at mile 25 by the emergency crew because he was weaving instead of going straight. They took his temperature and could not get a reading for him being so cold, so they side-lined him. After an hour of being in the warm medical tent covered in blankets his temperature was up to 89.9 degrees and he was ready to finish the race. Aaron being a Marine and not knowing the word “Quit”, he wanted to finish the race. The Officials would only agree to release him if the bike crew would follow and make sure he had no further situations. The athletes were thankful that the Official Bike Crew, from the Bicycle World of Houston, were there to give their support to Aaron which allowed him to finish the race. Paul was also a beneficiary of their support when owner Ryan helped him to repair his two flat tires at mile 12. After the race was over, the tires fixed and body temperatures were back to normal, Paul, Grant and Aaron talked of writing a book after this challenge of their experiences. The book would be called “Hypothermia in Texas”. A cold and rainy day in Houston at the Starting Line.